There is very little information about this artist who painted mainly seascapes. 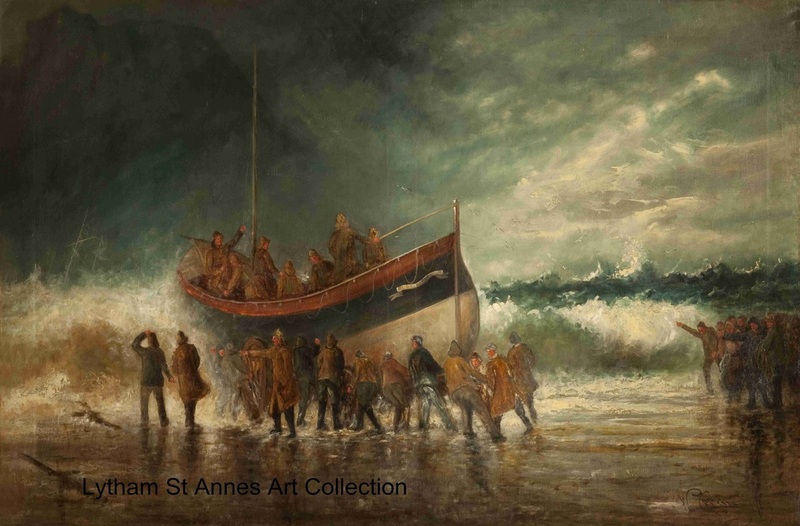 The lifeboat was called the 'William and Frances'. It was a 37ft rowing and sailing boat, built in 1895, which was pulled by two horses to the waters edge on a wooden cart with large wheels. You can see one of the cart wheels in the picture. There are seven crew members. They are on their way to a rescue and would only be able to use their oars as the sea is so rough. To the left of the picture there appears to be two masts of the stricken ship. The people to the left could possibly be relatives of those in danger at sea. It has been suggested that the lifeboat could have been launched at Bridlington. The most likely donor of the picture is Mrs Annie Clegg. Her husband was Edward Clegg, who died 6 December 1935. Edward was born in 1872 and lived in Park Road, St Annes. He possibly owned Clegg & Company, Auctioneers, Valuers and Estate Agents of The Square, St Annes.